Architecture’s limits define its norms. In Steps to an Ecology of the Mind, Gregory Bateson refers to “restraints” as the “causal circuits or processes within a system that guide the formal outcome in probabilistic terms.”1 Broadly understood, the scope of any discipline is thus subject to the restraints of the instruments and abstract models through which it exercises control and construct subjectivities. Who or what has authority over the instruments of architecture? What methods do architects employ to exploit the institutional protocols that govern the administration of standards and conventions? In what ways do they redefine “new” limits of architectural practice? In this sense, is there a universal canon of architectural expertise, or is it continuously created, and subsequently negated, in the process? Rather than adopt an antagonistic position and reject limits, or escape to an imaginary periphery by reframing what constitutes the core (or corps?) of practice, this essay examines the role of architecture and engineering publications, such as reference manuals, in structuring “disciplinary formations” of the eighteenth and nineteenth centuries.2 Such publications promoted a reciprocity between theory and practice. They provided a framework through which the outcomes of research and experimentation could be regulated and disseminated. What constituted expertise during this time was in a state of flux, until governmental bodies established professional scope and liability based on rule-of-law at the close of the nineteenth century; architects designed structures and assumed responsibility without an engineer’s counsel, engineers designed buildings without a connoisseur’s classical architectural training and builders built without approval from either.3 This polyvalent intertwining of disciplines in the throes of becoming modern was productive—as it fostered a “scientification of building knowledge” and standardized existing experiential knowledge into verifiable best-practices.4 In this regard, manuals were the instruments through which architecture and engineering established the standards, protocols and norms of contemporary practice. The expert-systems that constitute contemporary instruments of service—along with the methods and traditions through which design research is administered and transferred into the realm of convention—originated within this framework.8 Though the term “expert-system” originates from within twentieth century computer science disciplines, the underlying premise is that of a mechanism that collects, codifies and standardizes information through a system of abstraction, with the intent of inferring answers to queries. Whether by auto-correcting spelling errors or making structural recommendations based on best-practices, the correspondence between expertise and instrument is founded on the reciprocal calibration of knowledge with instrumental subjectivities. 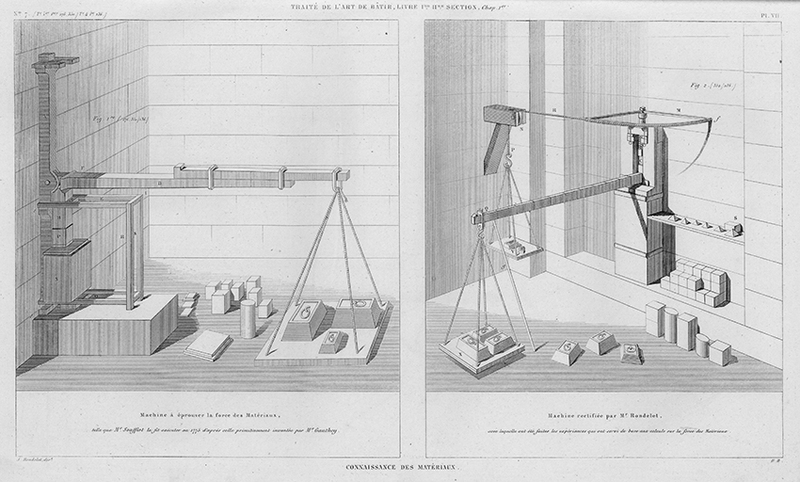 Connaissance des Materiaux, or Machine to test the strength of materials. From Traité théorique et pratique de l’art de bâtir (Paris : Chez l’auteur, 1812). As an administered value, then, precision is dependent on an institutional framework to enforce it—something possible only through collective accord, such as a universal reference measure. In this sense, it is impossible to characterize a stand-alone tool or object as an instrument, or as instrumental, without considering the administrative mechanism through which it is legitimized and maintained, and its relative precision regulated. Charpente, Assemblages. 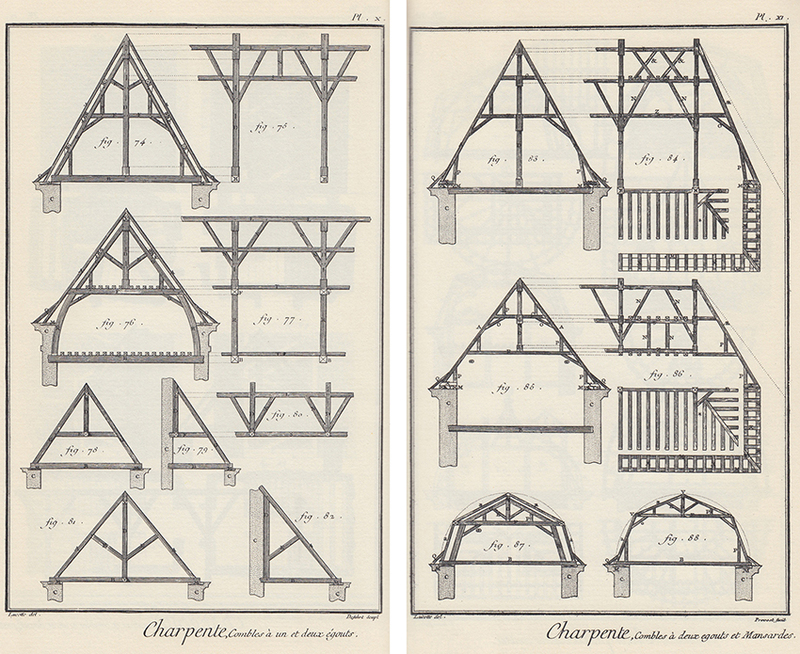 Wood-Framing Joinery from Encyclopédie, ou dictionnaire raisonné des sciences, des arts et des métiers (Geneve; Pari ; Neufchastel: Chez Briasson and others, 1752-1772). Architecture Couppe de Pierres. Architectural Stone-Cutting (left and middle) and Architecture Maconnerie. Architectural Masonry (right) Architecture Couppe de Pierres. 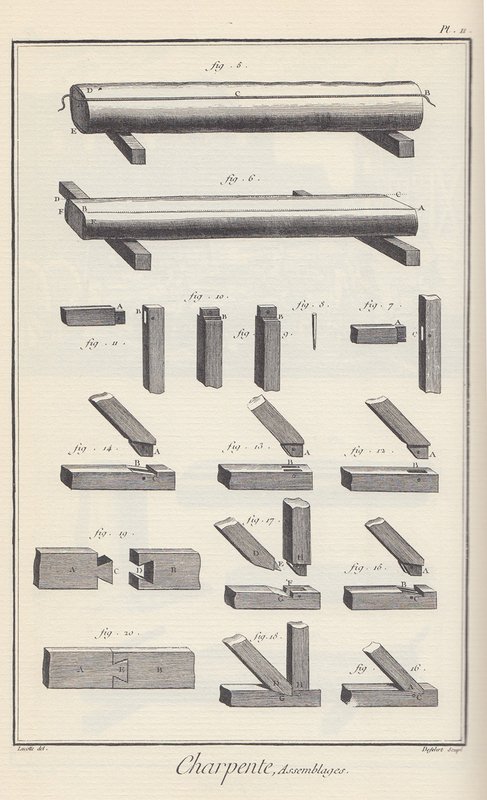 Architectural Stone-Cuttingfrom Encyclopédie, ou dictionnaire raisonné des sciences, des arts et des métiers (Geneve; Pari ; Neufchastel: Chez Briasson and others,1752-1772). Charpente, Combles a deux egouts et Mansardes. Wood-Framing for a Two Attic and a Mansard Roof (left and right) from Encyclopédie, ou dictionnaire raisonné des sciences, des arts et des métiers (Geneve; Pari ; Neufchastel: Chez Briasson and others,1752-1772). Through this use as a pedagogical instrument, the Encyclopédie established a reciprocal mimetic tradition in which general knowledge often controlled by trade guilds was transformed into expert knowledge regulated by state-run institutions. Through a universal system of representation—the collective authoring of working objects—norms and standards were reflexively adopted, and transformed the very trades and disciplines that served as their original subjects. 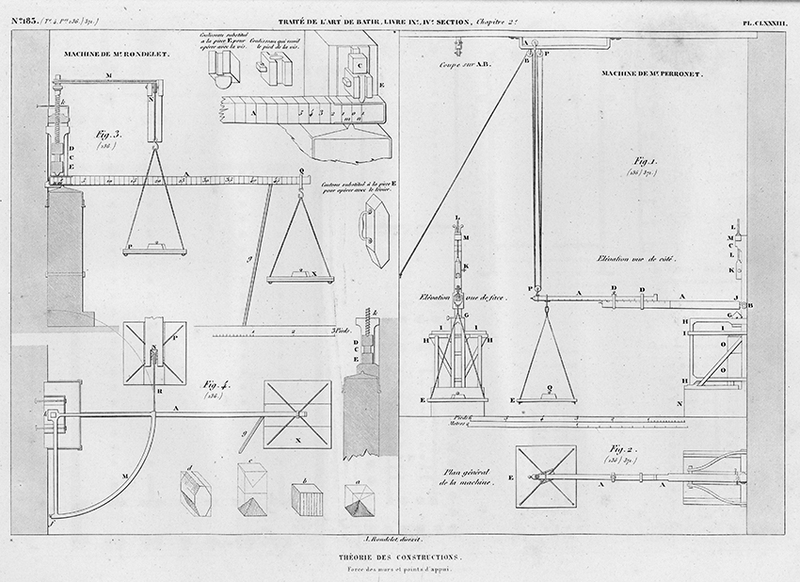 The processes of the latter echoed the desires of the Encyclopédie’s authors to simultaneously instill within craftsmen a “discipline, technique, and self-conscious systematic way of working” and provide the outcome of this effort in clearly delineated and understandable terms to tradespeople and the public at large.22 This is reminiscent of Bateson’s original provocation concerning the relationship between restraints and causal processes. The Encyclopédie produced a simultaneously retroactive and didactic calibration of knowledge—forming an incipient epistemological framework that could allowed for the production, reproduction and exchange of information between disciplines and institutions. Stéréotomie, Courbe fermées. 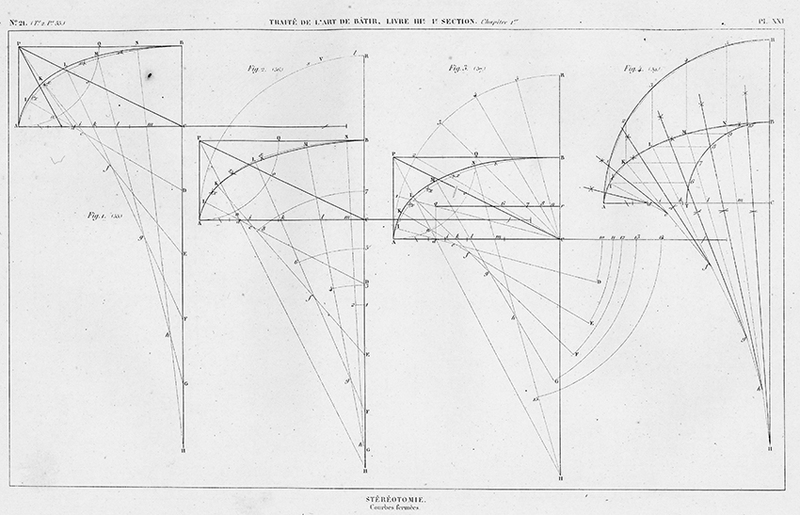 Closed Curves from Traité théorique et pratique de l’art de bâtir (Paris : Chez l’auteur, 1812). Connaissance des Materiaux. Knowledge of Materials, Strength of Materials. 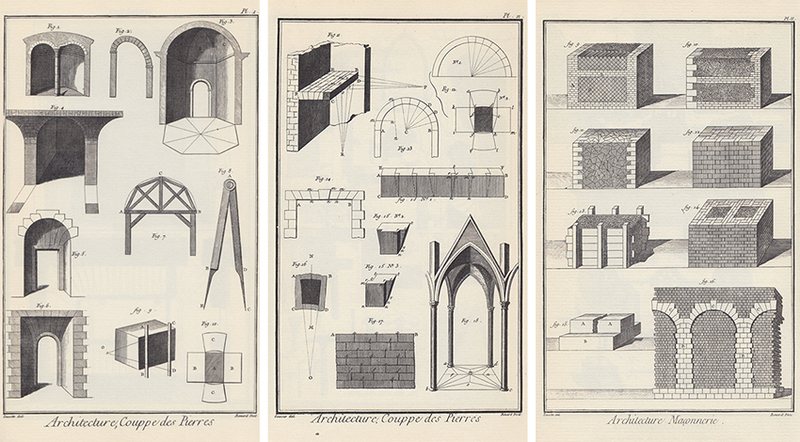 Theory of Construction, Simple Vaults from Traité théorique et pratique de l’art de bâtir (Paris : Chez l’auteur, 1812). In the years surrounding the Encyclopédie’s adoption by public drawing schools, similar institutions enforcing common disciplinary standards also emerged.24 From the “Polytechnics,” such as the German Bauakademie and French Ècole Polytechnique, to the Mechanics Institutes in England, the publication of lecture notes and textbooks became common practice—a critical strategy for disseminating standards and theories to practitioners.25 They prepared the ground for a boom in the publication of professional journals, reference manuals and textbooks at the cusp of the eighteenth and nineteenth centuries. Theorie des Constructions, Murs de revêtement. Walls and Cladding from Traité théorique et pratique de l’art de bâtir (Paris : Chez l’auteur, 1812). Theorie des Constructions, Force des murs et point d’appui. Strength of Walls and Supporting Points from Traité théorique et pratique de l’art de bâtir (Paris : Chez l’auteur, 1812). Charpente, Nous et Noulets. Wood-Framing from Traité théorique et pratique de l’art de bâtir (Paris : Chez l’auteur, 1812). Charpente, Disposition des élément des fermes. Framing element layout from Traité théorique et pratique de l’art de bâtir (Paris : Chez l’auteur, 1812). 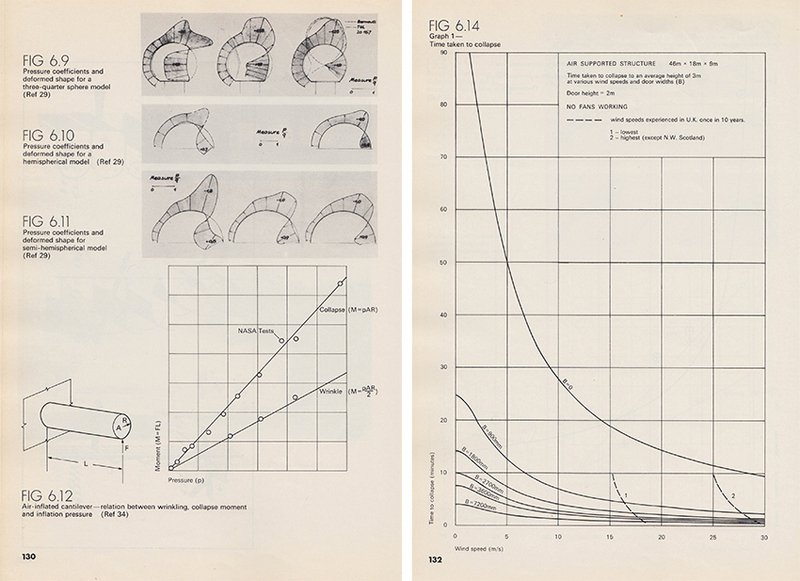 Manuals charted a transition from observation to analysis. 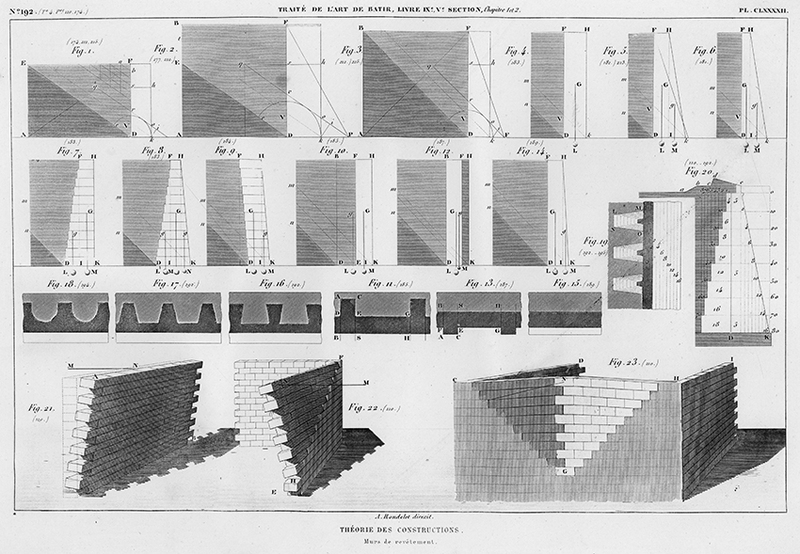 They shifted away from a pre-theoretical, or “overlay” mode of thinking—which guided the design of new structures based on rules-of-thumb—and towards “model thinking,” which had its basis in calculation.30 Overlay thinking is evident in the “evolutionary model” emphasized by the French architect Jean Rondelet in his Traite theorique et pratique de l’art de batir of 1812-1817, and is consistent with the practice of innovation through “transfer”—a retroactive projection of knowledge from one system onto another.31 Adoption of new materials and new construction methods that deviate from convention was thus buffered by precedent, which provided a reasonable measure of prediction. This is evident in cases where cast iron was first introduced in building construction—when its use mimicked timber structures—as in the case of the iron columns used by the architect George Steuart to support the upper-gallery of St. Chad’s Church in Shrewsbury, England.32 In defense of Rondelet, the Traite theorique et pratique de l’art de batir performed its own radical detouring. It took advantage of the well-established accessibility of the encyclopedia by conflating its graphic conventions with some examples of analytical models—the classic wolf in sheep’s clothing tactic. Serrurerie, planchers et comble en fer de la bourse de Paris. 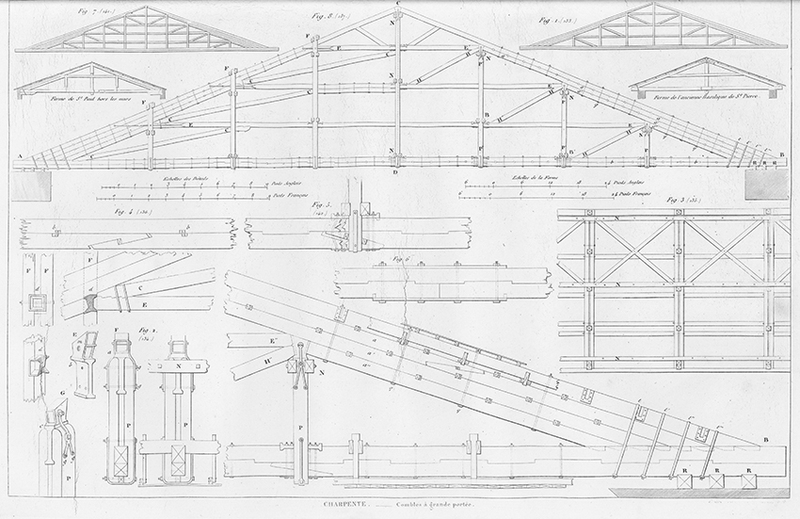 Ironwork, Floors and iron roof of the Paris Stock Exchange from Traité théorique et pratique de l’art de bâtir (Paris : Chez l’auteur, 1812). Serrurerie, Combles. 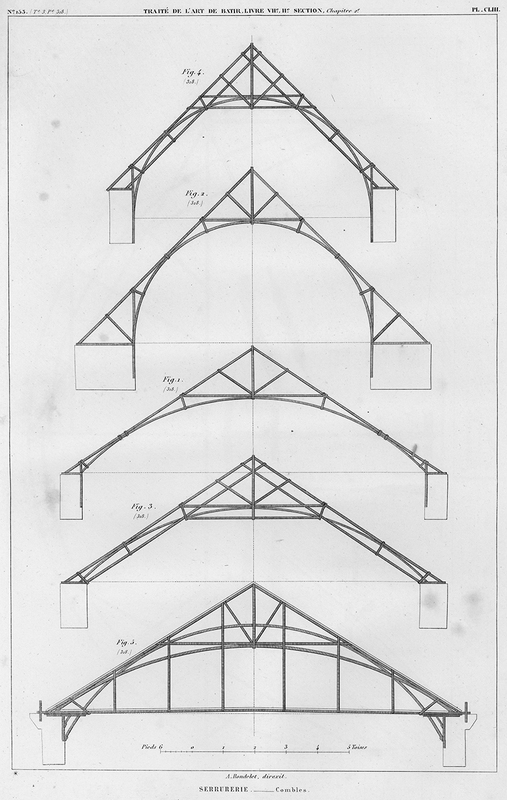 Iron framed roofs from Traité théorique et pratique de l’art de bâtir (Paris : Chez l’auteur, 1812). 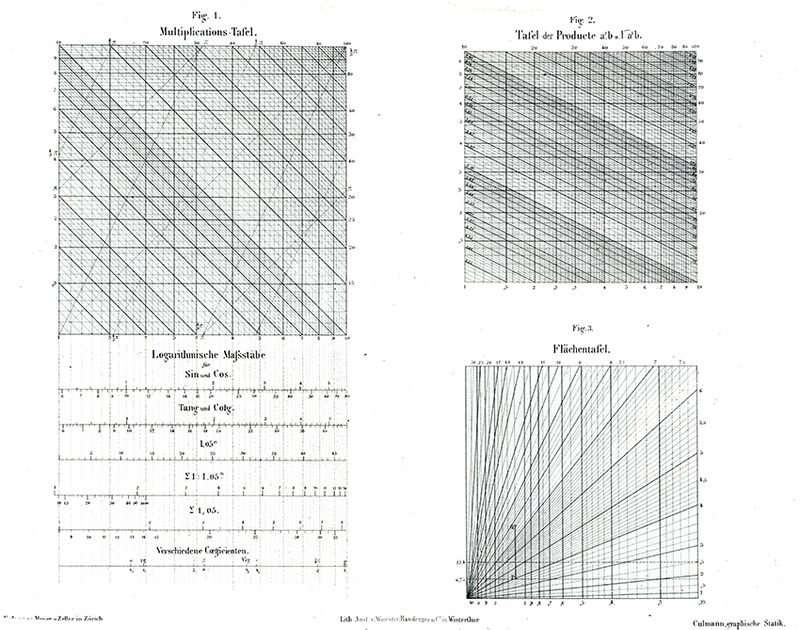 Tables and Scales from Die Graphische Statik (Zürich: Meyer & Zeller A. Reimann,1875). 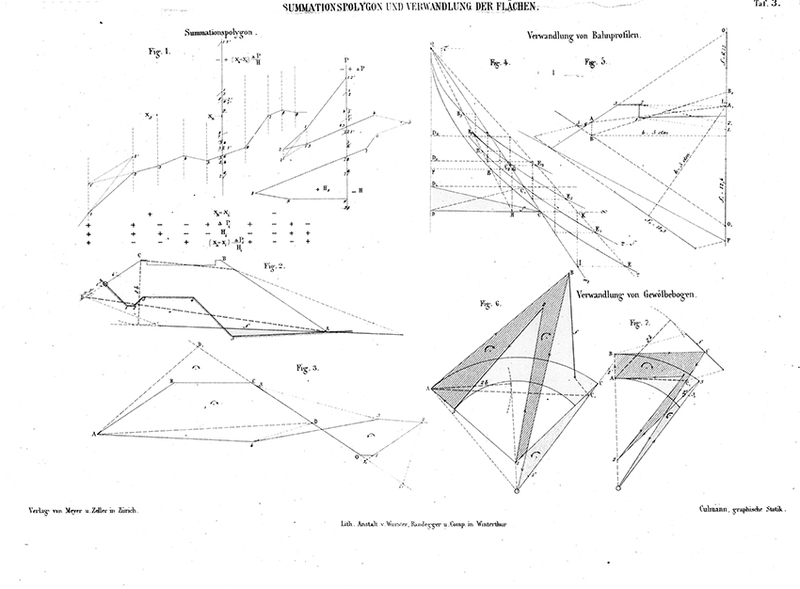 Summation Polygon Analysis of Web Profiles and Areas from Die Graphische Statik (Zürich: Meyer & Zeller A. Reimann,1875). 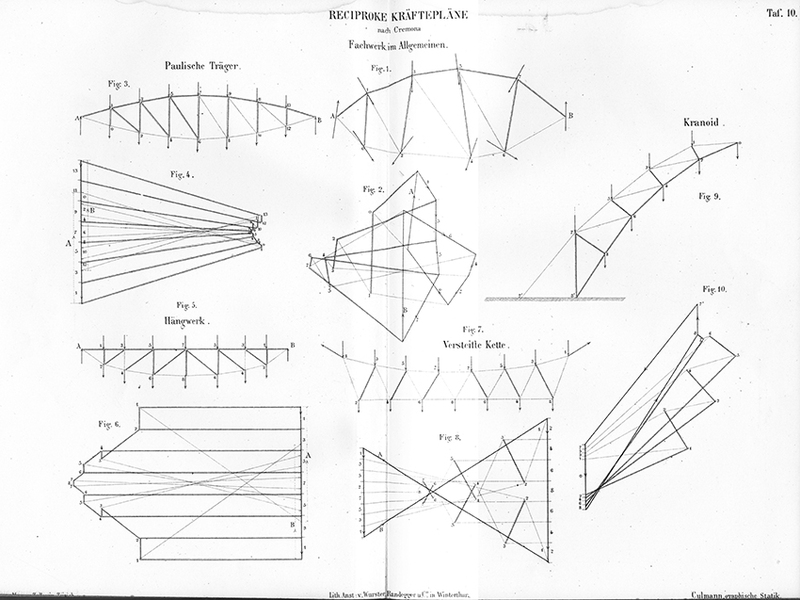 [Fig_19: Reciprocal Force Planes of various structural forms from Die Graphische Statik (Zürich: Meyer & Zeller A. Reimann,1875). 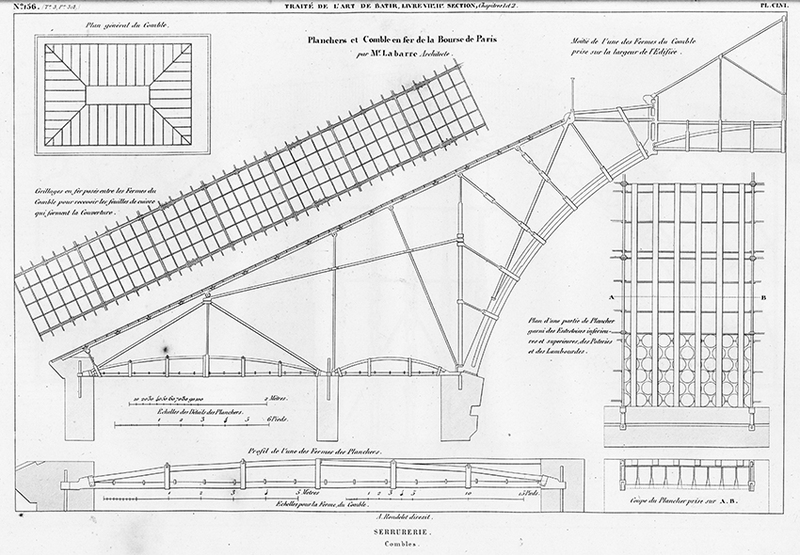 Architecture and engineering manuals reflected many of the same ideological principals that buoyed the socially transformative cause of Diderot and d’Alembert’s Encyclopédie, and reflected the “ensemble formed by the institutions, procedures, analyses, reflections, calculations and tactics” at work in Foucault’s governmentality. Under the umbrella of governmental rubrics, the instruments available to architects and engineers became sublimated within the space of practice, and grew to define the limits of the profession vis-a-vis the organizational constraints of expert-systems. The inevitable economic concerns of practice were also altered by the rise of governmentality. The analysis and preparation of drawings by architects and engineers would be governed by a familiar negotiation between value and efficiency—typically applied to the design of the structures themselves—in the terms of the monetization of labor, and in the form of the billable hour. Similarly, projective cost estimation allowed for the “economic re-valuation of work,” comprising yet another precisely calculated project metric.33 This convergence of liabilities, whether in the form of structural and material failure, construction budgets or labor costs associated with practice, became progressively interrelated. They were defined as tangible and finite within the confines of actuarial tables used by financial institutions, developers and eventually corporations. In this regard, the expert-system-as-manual turned its focus inward and onto the needs of the profession as it transformed into an organizational discipline rooted in the space and culture of the office. The content of manuals embodied this ethos, seeking out potential efficiencies within the labors of practice, identifying new areas of desired competence and omitting those that were superseded. Der Ingenieur, Sammlung von Tafeln, Formeln und Regeln der Arithmetik, Geometrie und Mechanik was published in 1848 as a distillation of the epic three-volume reference first released in 1845, entitled Lehrbuch der Ingenieur und Maschinen-Mechanik. In the forward to Der Ingenieur, the German mathematician and engineer Julius Weisbach describes it as “a work intended for the instruction and guidance of practical men.” It is not a particularly attractive book.34 The contents are by most standards quite dense. There were no plates to rival those in the Traite theorique et pratique de l’art de batir or Encyclopédie. Instead, Weisbach assembled state-of-the-art knowledge in applied engineering, much of which took the form of charts, span tables and nomograms, or two-dimensional graphic “charts” used to easily calculate complex mathematical functions (Willis Carrier’s psychrometric chart is a well-known example).35 These instruments dramatically reduced the amount of time engineers and occasionally architects would otherwise spend on making observations, or calculating and testing potential solutions. Requiring minimal training to use in practice, they enable the application of precision without empirical, expert knowledge. The underlying intentions of Der Ingenieur were accessibility and efficiency—“structured and prepared in a way that [one] could use for their daily business”—without the need to deduce or prove any underlying principles.36 Manuals articulated a collectively held definition of precision, accuracy, safety and risk. Conversely, too, they reinforced standards and conventions in a way that required perpetual revision to maintain coherence and applicability—an approach that could place the “new” in a potentially antagonistic relationship to existing institutions that prioritize disciplinary legacies. 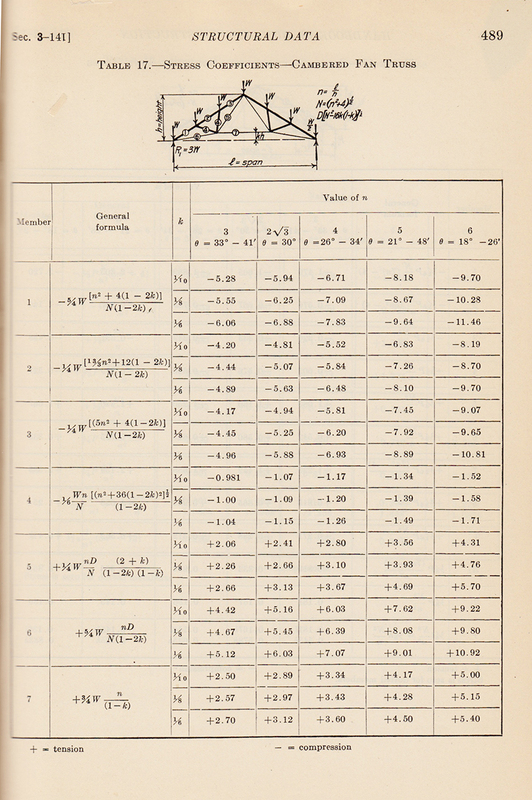 Stress Coefficient Table for Trusses from Handbook of Building Construction (New York: McGraw-Hill 1920). 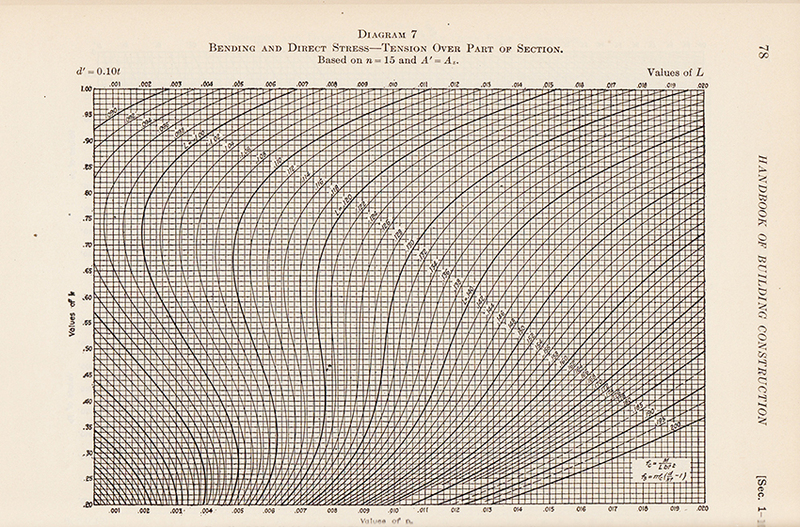 Stress and Bending Nomogram from Handbook of Building Construction (New York: McGraw-Hill 1920). 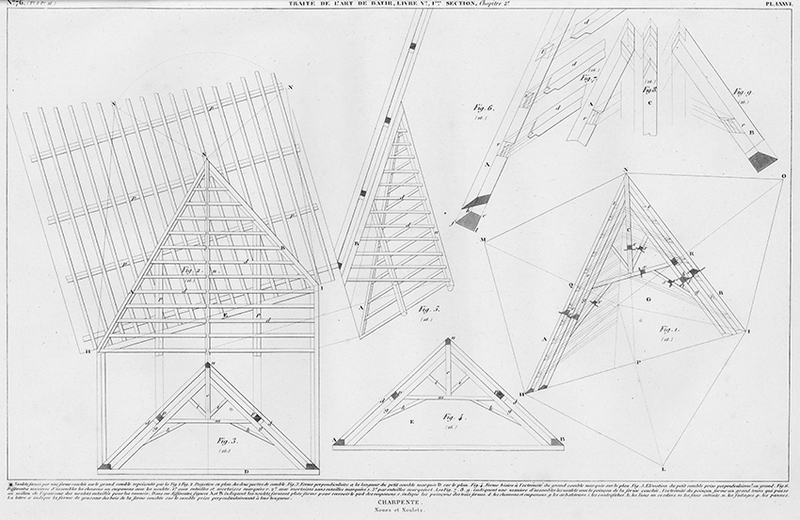 Truss Elevation from Handbook of Building Construction (New York: McGraw-Hill 1920). Der Ingenieur serves as a significant benchmark in the foundation of the genre of engineering manuals, and was followed by other notable publications, such as William Rankine’s Useful Rules and Tables in 1866 and John Trautwine’s Civil Engineers Pocket-Book in 1872-1911.36 The latter was published by John Wiley & Sons (called William Halsted Wiley prior to 1875), and its popularity as the “engineer’s Bible” led to the publication of seventeen editions by 1894. It also contributed to the success of Wiley, which has applied a similar pocket-book reference strategy to architectural graphic conventions and best-practices in the Architectural Graphic Standards since 1934. Similarly, the history of the McGraw-Hill book company is tied to its acquisition of a number of trade journals and technical publications. It represents the gradual privatization of knowledge-making that was symptomatic of the emergence of a modern publishing industry in the nineteenth and twentieth-centuries. Publishing houses, and not discipline-specific institutions, became important arbiters of architectural standards and conventions, one whose interests alternately converged and diverged with practice. Earlier manuals emerged from the broad scientification of knowledge attributed with the enlightenment , and thus served as pivots for governmental transformation and the establishment of disciplines. Despite their seeming utility, mass market handbooks were by definition more concerned with market share and profitability. Thus authority for administering and maintaining instruments of service became entangled with economics of media and publishing, and not immediately implicated in design, building or construction. What potential strategies might encyclopedias and manuals suggest to the contemporary praxis of design research? Manuals are one of an ensemble of instruments in the discipline that assemble and imagine categories of knowledge by organizing, curating and indexing precedents. In this way, they provide a mechanism to identify new best-practices. How can architects and engineers reposition the core of the discipline and chart new limits by leveraging these instruments for the administration of knowledge? Is there an activist model of practice that can operate from within the established protocols of the manual? Air-Pressure Nomogram from Air Structures: A Survey. (London: Lightweight Enclosures Unit, 1971). 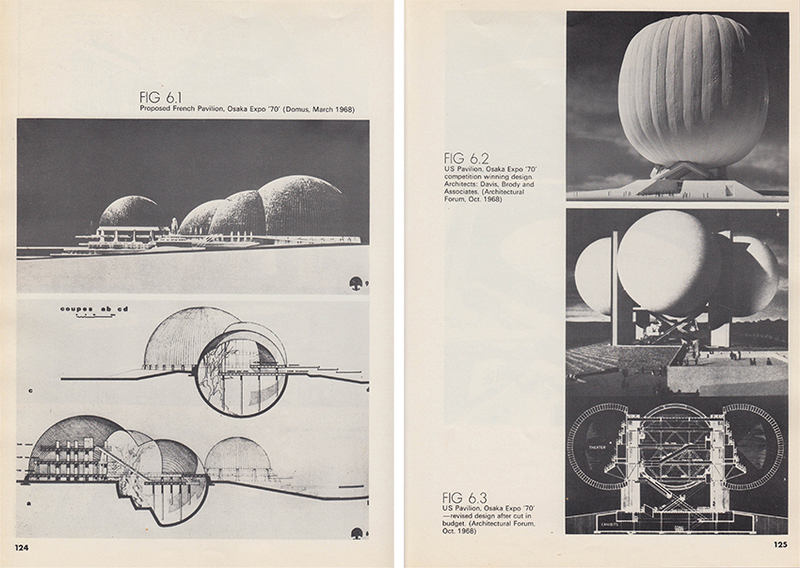 French and U.S Pavilion proposal for World Expo in Osaka, Japan from Air Structures: A Survey. (London: Lightweight Enclosures Unit, 1971). 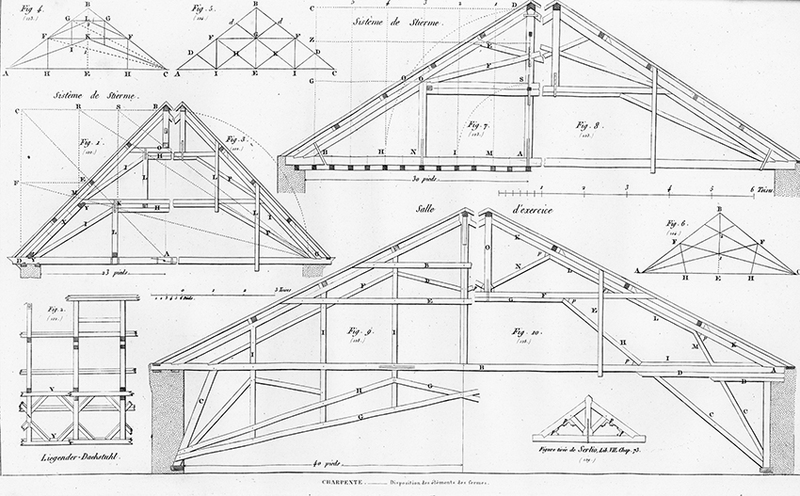 Air Structures synthesizes the trajectory of early manuals such as Rondelet’s Traite theorique et pratique de l’art de batir, which emphasized the rationalization of construction, with later engineering-specific manuals characterized by Weisbach’s Der Ingenieur, which embraced abstract analytical and calculation-based models. The combined sum is a generalized survey, an aggregation of existing technical references in the service of producing comprehensive knowledge. Unlike the latter examples, however, which were more concerned with the regulation and innovation of existing methods, Air Structures serves as an example of a retroactive mode of design research—one that instrumentalized a collection of precedents to form a novel construction methodology. In eight chapters, it addresses the theoretical structural principles, design methods, specifications and cost-analysis of various pneumatic assemblies. Probability based on similarity is the underlying concept, as the outcomes of disparate design research by a panoply of architects, engineers and scientists are indexed into a distinct and coherent body of knowledge. The publication bolsters the idea that disciplinary expertise is fluid, and reminds us that shifts in what constitutes core expertise are contingent on the very instruments that establish reference standards, norms and conventions. What began at the start of the eighteenth century as a polyvalent condition between architecture and engineering became progressively interiorized and balkanized, as disciplinary communities became increasingly anxious about asserting professional and intellectual boundaries. In this context, the role of prototypical expert-systems such as reference manuals was to provide evidence—as an effective synthesis of heuristics and theory—that reinforced and documented practitioners’ scope of expertise. As the transition from encyclopedic objectivity to the analytical overlay of Rondelet or Viollet-le-Duc shows, architecture and engineering adopted a role of standardizing and regulating a commonwealth of experiential knowledge. If the selection of any particular approach to representation or the favoring of certain construction methods yields a distinct subjectivity, for architects and engineers, this subjectivity is primarily organizational. The conduct of practice is regulated by a network of economies and disciplines dependent on evidence and precedent, as well as the reciprocal actions of adjacent institutions — banking and finance, for example. To return to the question of who or what has authority over the instruments of architecture, we inevitably contend with the limits and tactics of architectural agency. As manuals shift from a mode of instruction based on experiential knowledge to the production of abstract, model-based expert-systems—ones invested with the intelligence of theory and projective analysis—what emerges is a role of the instrument that is interchangeable with and indistinguishable from practice itself. This condition of interiority or restraint is not impenetrable. Price and Newby’s counter-manual, Air Structures, reminds us that the manual can construct new territories of knowledge and spaces of practice; it inverts the conduct of knowledge from theory to practice ascribed to its predecessors. More precisely, Air Structures is a realization of the manual as a project, which invents precedents and authors its own standards. In this way, it is a demonstration of architectural production that is committed to introducing new norms into practice, or that actively asserts the authority to administer the instruments of practice, and thus service. If anything, the cautionary tale of encyclopedias and manuals stems from the conditions they sought to ameliorate—the unsecured experiential knowledge of craftsmen, the emphasis on design connoisseurship and judgment, and the tendency of building techniques to fall out of use. The latter is particularly daunting for contemporary practice, as it underscores the necessity of institutional commitment to preserving and disseminating building research and theory in perpetuity. 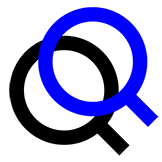 In fact, the adoption of innovative techniques and materials has historically corresponded with its standardization, rather than any breakthrough or one-off project. The work of the English architect and engineer Christopher Wren, and in particular the use of iron catenary chains in the reinforcing structure of the dome of St. Peter’s Cathedral in London, built from 1675-1711, provide an example of innovation that falters in the absence of institutional administration. 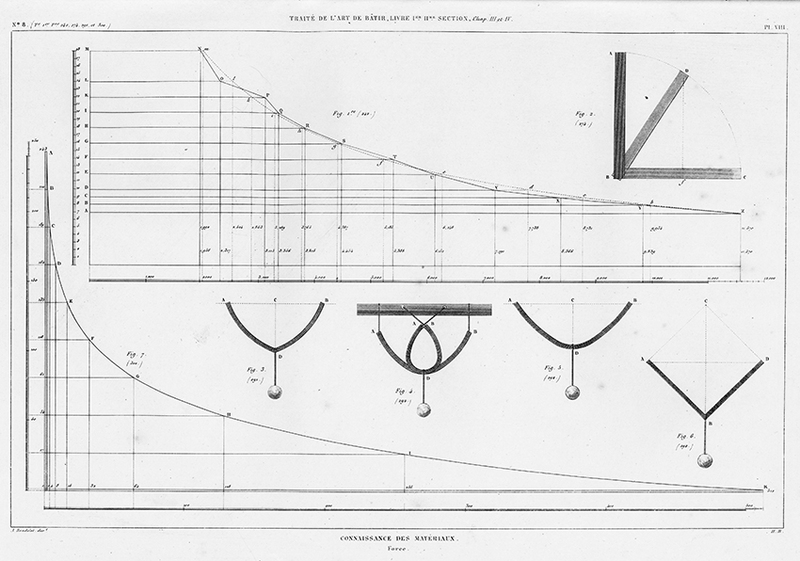 Wren had made use of a new theory of statics developed by Robert Hooke in calculating structural loads, and the project marked the “first time that a design methodology based on statics was used for a major new structure.”40 Yet despite Wren’s and Hooke’s exceptional abilities, their advancements never had the potential to influence daily practice because there was not an explicit effort to transform this unique precedent into a generalized application through the publication of a manual of instrumental drawings.41 After all, how could design research contribute to the discipline without any reciprocal development in the conditions under which these theories were administered, generalized and applied as instruments in service? Filip Tejchman is assistant professor in the School of Architecture and Urban Planning at the University of Wisconsin–Milwaukee. He is the founder of Untitled Office, a design practice that explores the intersection of building, culture, and thermodynamics. His writing has appeared in Volume, the Journal of Architectural Education, MUSEO, and the Praxis Journal of Writing + Building and his research has been awarded a Graham Foundation Grant. Tejchman has previously practiced at the offices of Diller Scofidio + Renfro and Joel Sanders Architects. LABORATORY SERIES. No.10. Iron Lung Ward at Rancho Los Amigos Medical Center during the 1952 Polio epidemic. 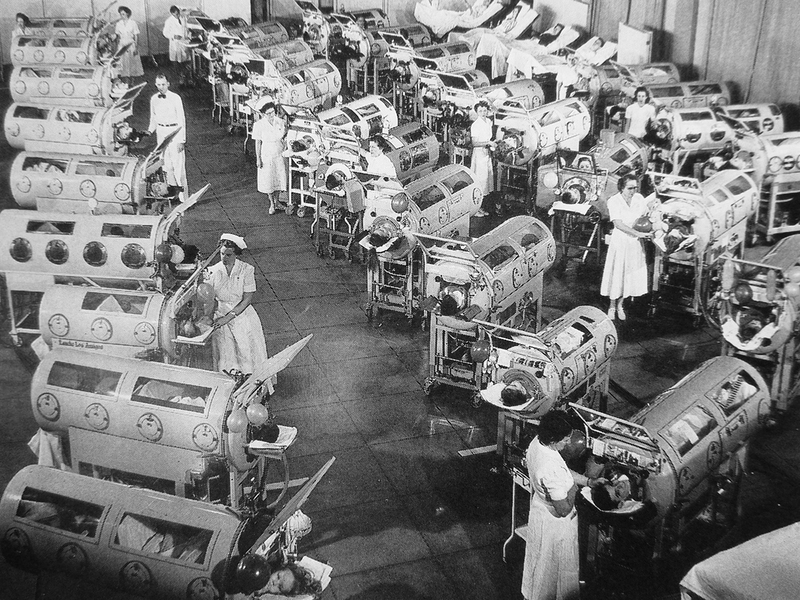 The Iron Lung was developed as a temporary respiratory aid for polio patients unable to breathe on their own. Subjects, primarily young children, were confined to the airtight chamber from the neck down. Acting as an artificial lung, the apparatus created a negative pressure environment around the subject’s torso allowing the patient’s lungs to expand and contract. Photo: Wikipedia.